The Painted Desert Sheep originated on Texas game ranches by crossing Mouflon Sheep with Rambouillet, Merino and Texas Blackbelly. 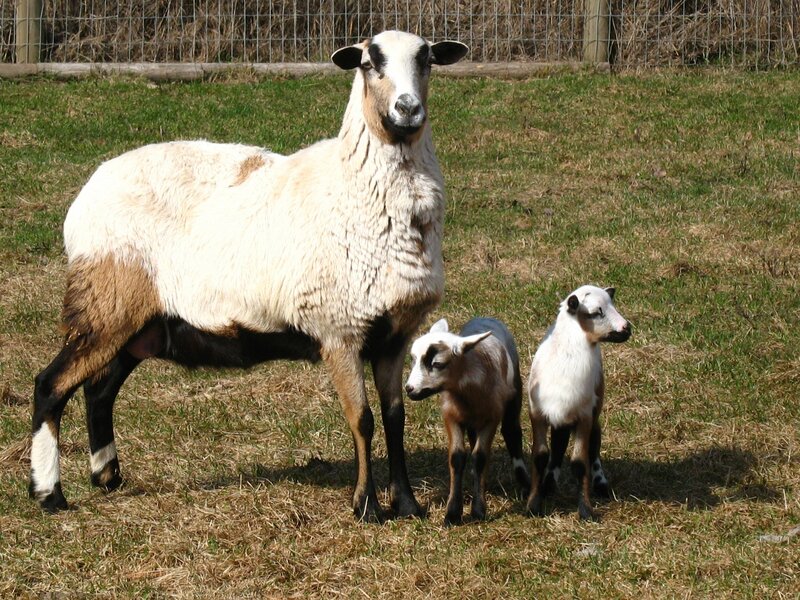 The coloured varieties of these sheep produced hybrid, spotted individuals, and were known as Parti-Dalls. Hunters wishing to add these colorful sheep to their trophy rooms started to call them “Painted Desert” sheep. The first impression of an ideal Painted Desert Sheep is of an alert, regal and athletic animal of obvious Mouflon heritage. It is a nicely coloured sheep with a slick, smooth hair coat. 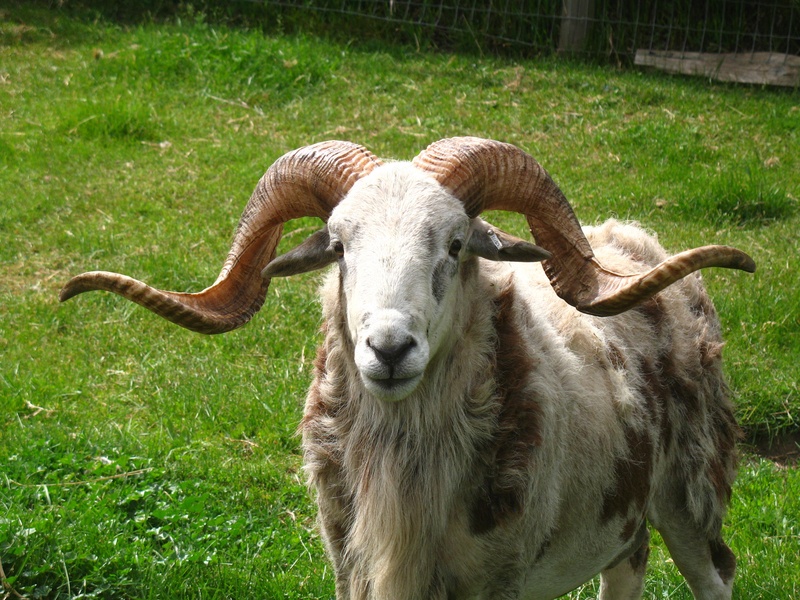 Mature rams should have large uniform horns with a full mane and bib; the nose is Roman shaped. Producers aim for their rams to achieve Gold Star Ram (*GSR) status by the 2 year mark. *GSR is designated to the rams who have achieved Gold Star Ram status on the PDSS registry pedigrees. Ewes are finer boned with a distinctly feminine face. Painted Desert sheep are hair sheep with a double coat, and will fully shed their winter coats in the spring. There is no shearing, crutching, or docking of tails required. These sheep are well adapted to winter and summer climates. Painted Desert Sheep are a hardy breed, naturally resistant to many parasites, and are excellent browsers. They are great mothers, often raising triplets without concern. Our livestock is primarily for breeding stock. We focus on large horns, good colour, and lovely temperament. Any livestock not producing good horns and colour are either sold at a reduced rate, or are sold as locker lamb. We will register only livestock that we are proud to put our farm name on. Our herd is still in the development stage, and we are holding back the best ewe lambs for our breeding program going forward. We are hoping to be able to produce consistent colour and horn genetics in our flock- but it is a work in progress. The meat of the Painted Desert Sheep is wonderfully delicate with a mild flavour raved about by our customers. It is typically a lean meat with no mutton taste even with older animals. Our hanging weights are typically around 50-60 pounds (in your freezer) at 7 months of age. Our Flock was certified Movi free in 2017. Mycoplasma ovipneumoniae is a serious threat to our wild Big Horn Sheep populations. We love our Painted Desert Sheep, and will have no other breed. Beautiful sheep cost the same to raise as plain wooly breeds, perhaps even less... I just want something really nice to look at. This is one of our herd sires, Circle C's Nuclear Phin; imported all the way from Texas. Big thank you to Mark Chaney. This is our youngest herd sire, Circle C's Stormin Kutenai, imported all the way from Texas. Kutenai has attained Gold Star Status as of July 2018 with a total measurement of 98 4/8"; he has broken the tips off both horns. 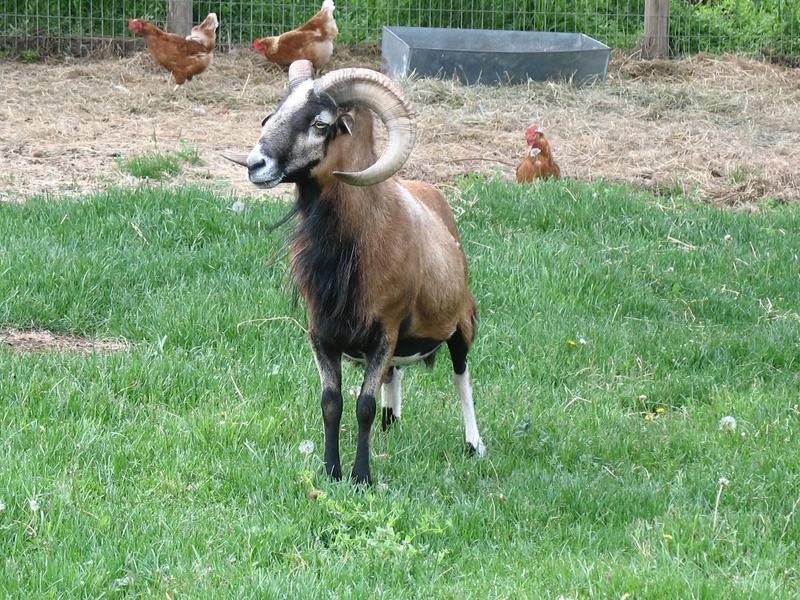 This is Big Rock Zulu, our foundation Ram. We actually chose him out of a herd of American Blackbelly Barbados when we knew nothing of this breed of sheep. It was later when he started throwing tons of colour in his babies and when we discovered Barbados are not allowed to have white on them that we realized what we had. He is a lovely boy with a great temperament. We spoke with the Painted Desert Sheep Society and registered him as a Painted Desert.